On May Day, as in many other places around the world, thousands of people gathered in squares and streets all over Italy to celebrate International Workers’ Day. The celebrations took different forms, from concerts to direct action such as disputes with shops which had stayed open. 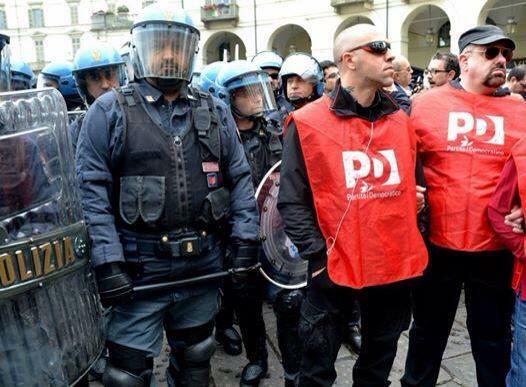 May Day was particularly tense in Turin. There was a large demonstration in which both centre-left parties like the PD and radical social movements (which marched together in a distinct group, the so-called spezzone sociale ) took part. At one point, the presence of the PD deputy Stefano Esposito – a prominent supporter of the TAV project – led to challenges by social movement and NoTAV activists. Groups from the Spezzone Sociale chanting ‘fuori il PD dal corteo!’ (‘PD out of the march!’) were attacked and clashed with police forces. The economic and social backdrop to May Day in Italy in 2014 is depressing. According to the CNA’s research institute (the Italian confederation of small and medium size enterprises) over 18 million people are now classified as ‘at risk of poverty and social exclusion’, 3 million more than 2007. They have an income of less than 60% of average income. At the same time, the average age of the population has gone up, as an increasing proportion of people choose (or are forced by age or poverty) not to have children, or to have fewer, in part because of the economic crisis. What’s more, the CNA’s research states that the number of crimes has gone up by 8.7%, making Italy a more violent and more insecure country. This entry was posted in Grassroots movements, Labour, Political parties, Politics, Unions, [en] and tagged CGIL, CISL, Democratic Party, May Day, notav, police, Turin, UIL. Bookmark the permalink. I believe this stuff does not only happen in Italy. Many countries around the world also suffer from poverty and inequality. But the increasing figures reported regarding crimes and poverty risk are very alarming.